Home Guest Editorials Avocado … a Raw Food Staple! of his diet helped him to transition to a raw food lifestyle. Avocados were a huge help when I jumped into a 100% raw food diet overnight and stopped eating cooked food cold turkey! How did I do it? Well, many things helped, such as colon cleansing to help move out all of the detoxification and withdrawals at an exponential rate. When a person jumps on a 100% Raw Food Diet, the density and the concentration of the food is a lot less compared to cooked and processed foods. The end result usually leaves a person “starving” for more food. The way I handled that was putting 3–5 avocados and mushing it into my dinner salad! I would take kale or lettuce and mix it with a lot of salty tasting dulse and I’d take all these avocados and mush it all together with my bare hands. Once I turned my salad into a guacamole looking salad, I would pour in a ridiculous amount of cut up tomatoes and mix it all together gently to make sure not to smush the tomatoes. I fiended for that salad every single night. That did a pretty good job of keeping me well satiated, even though I still desired more afterwards in the beginning stages. I ended up eating fruit sometimes, which didn’t feel the best on my digestive system. How was I able to eat 3–5 avocados a night?! It was such an improvement to my previous diet of Standard American Diet processed foods, that my body had no issue with that many avocados. However, as the months and years went on, my body became cleaner from all of the detox and withdrawals, and my body became more efficient. My body started to require less food to maintain high energy levels. After about 7 years on the 100% Raw Food Diet and eating this same salad every single night, I started to wake up with a runny nose. Now the 3–5 avocados was too much for my new cleaner body. So I cut the quantity to two large avocados and took it from there. When a person first goes on a Raw Food Diet, they think that they have to restrict themselves and watch their fat intake, etc. This is one reason why people fail. Anyhow, let’s look at some of the benefits of the avocado! An Avocado a Day May Keep the Doctor Away! 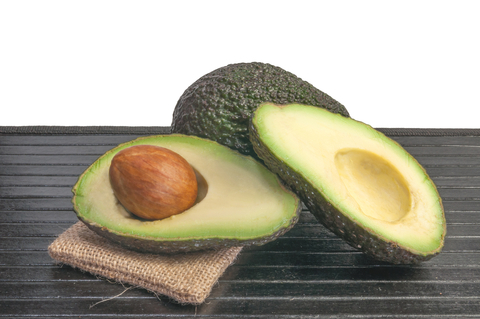 New study shows that eating an avocado per day significantly decreases LDL cholesterol and improves heart health! Be adventurous and try delicious raw recipes to incorporate avocado into your diet! When thinking of eating avocado’s try to branch out from guacamole and try raw chocolate avocado mousse, avocado soup, zucchini pasta with creamy avocado sauce, raw avocado fries, avocado kale pesto, smoothies and salads. Avocado is versatile and the perfect base for a creamy dressing, sauce or even dessert!